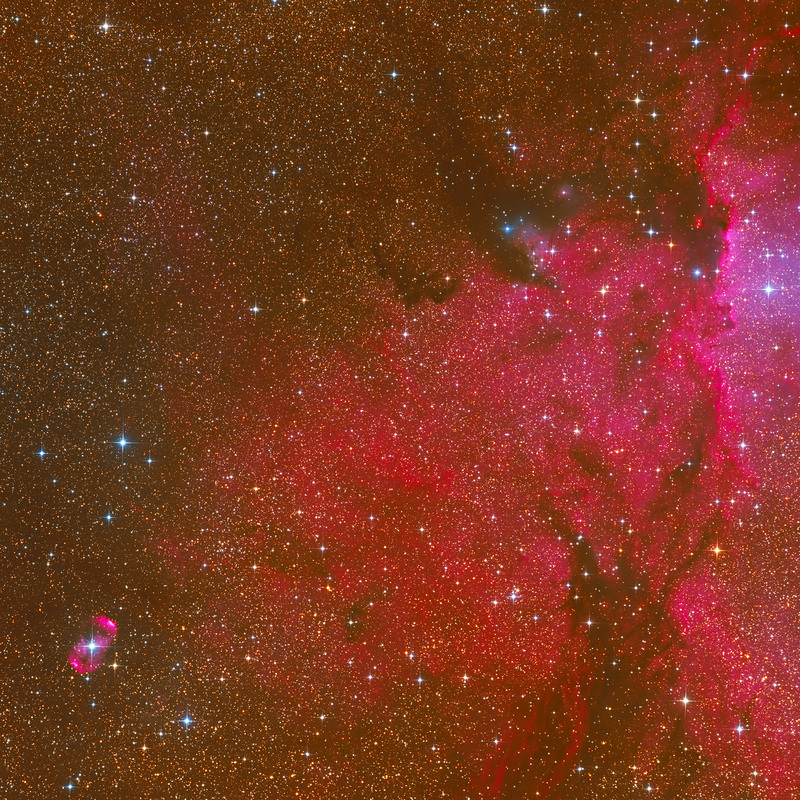 NGC 6164 and NGC 6165 are the two brightest bulge of the bipolar nebula associated with HD 148937. 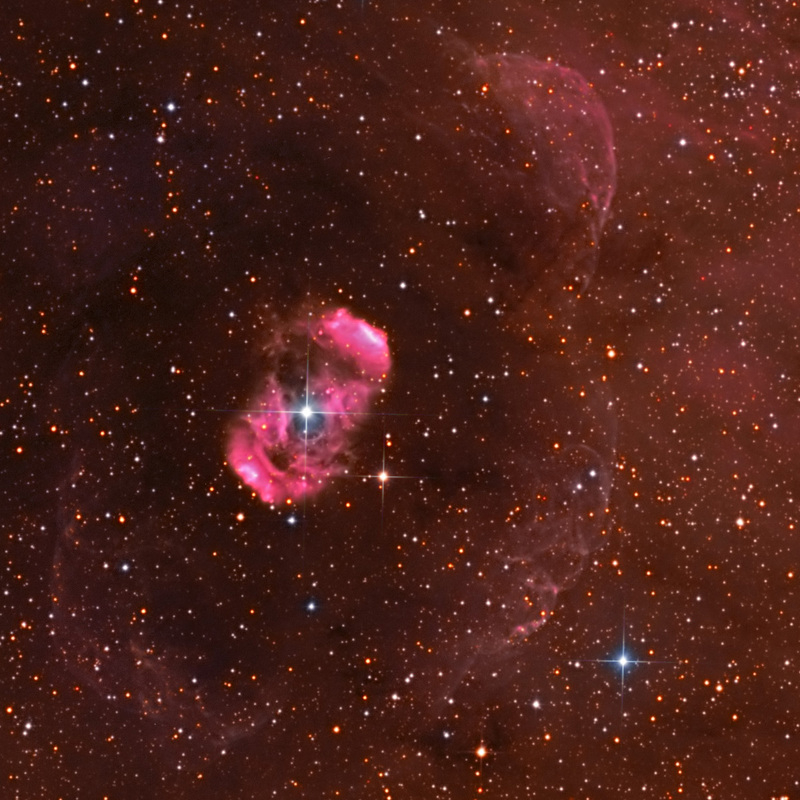 The nebula is very probably related to faint concentric nebular arcs with radii of 13' and 45'-65' around that star. Superficially similar to a planetary nebula, NGC 6164-5 is in an unusual object associated with an unusual star. The amazing blue central star, known as HD 148937, is the brightest member of a triple system of stars in orbit around each other. This extremely hot star is losing mass from its outer layers continuously, but sometimes more powerful outbursts give rise to the symmetrical shell-like ejected nebula. The true age of the star is not known although estimates of its age vary from a pre-main sequence age of 350 000 years to a more evolved age of one to two million years. HD 148937 is a peculiar type of Of star with exotic emission lines (carbon emission lines (CIII) equal in strength to Nitrogen (NIII)) and other peculiar spectra indicative of significant mass loss. Only five such stars are known to exist, three in our galaxy and two in Small Magellanic Cloud. 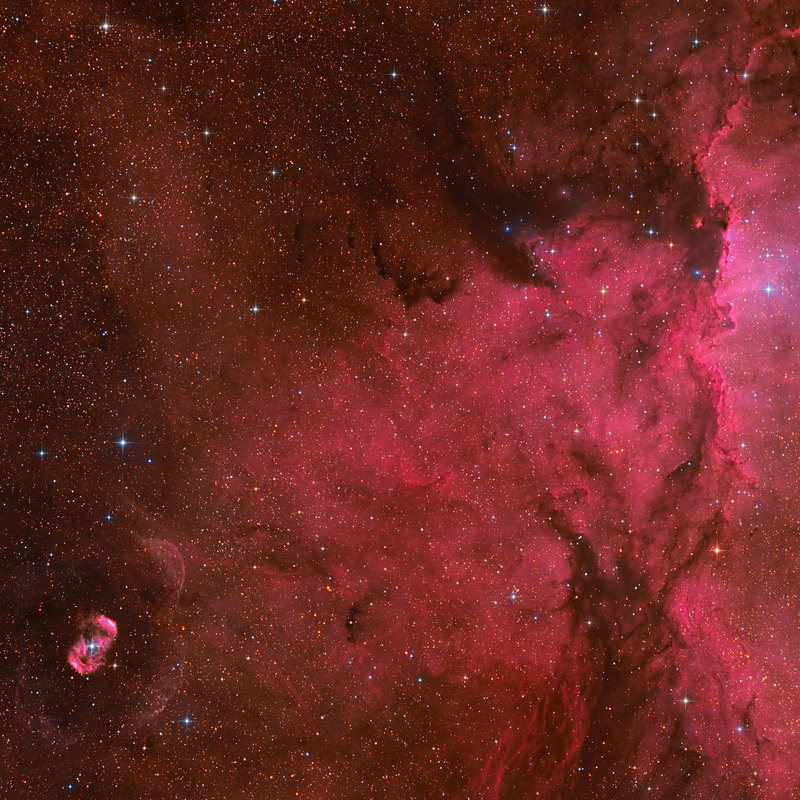 The two catalogue numbers, NGC 6164 and NGC 6165, refer to the nebula shells as separate objects. The nebula is in Norma at a distance of about 4 200 light years. 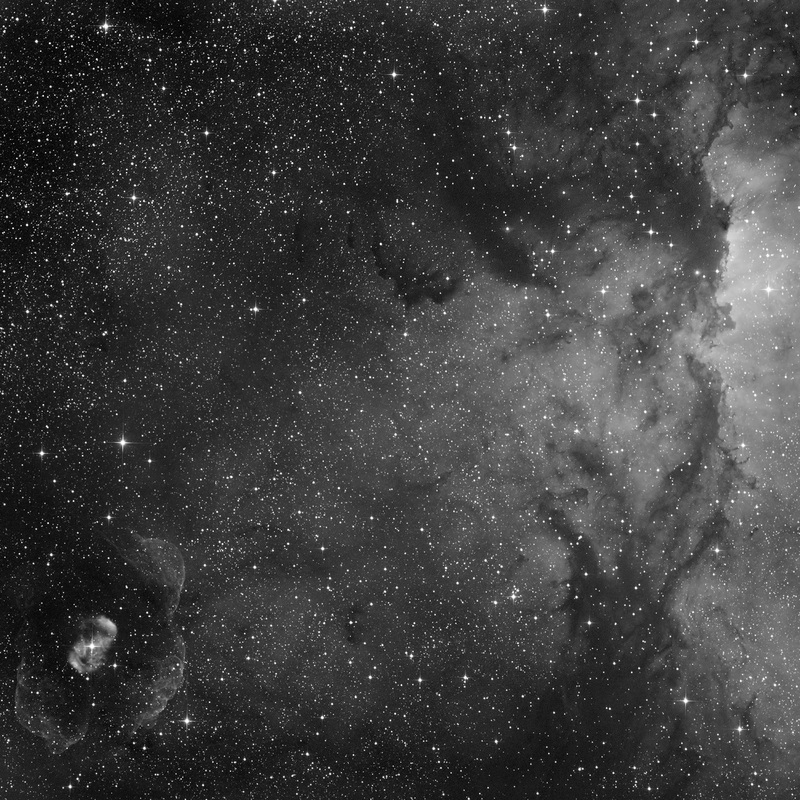 Interesting shape of NGC 6188 (Rim Nebula) is seen on the right side of the frame. The nebula is clouds of glowing hydrogen gas, about 4 000 light-years away in the southern constellation Ara. The nebula complex is a large cavity expanded by the Ara OB1 stellar association, very massive, young stars powering the nebula glow with stellar winds and intense ultraviolet radiation. 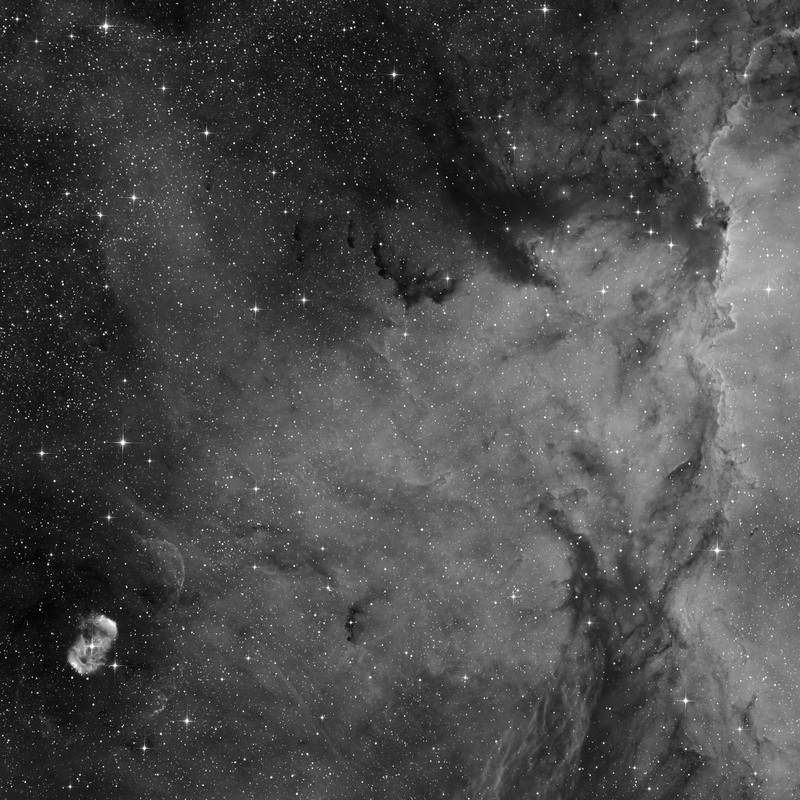 The cluster NGC 6193 (partly seen) is embedded in the NGC 6188.